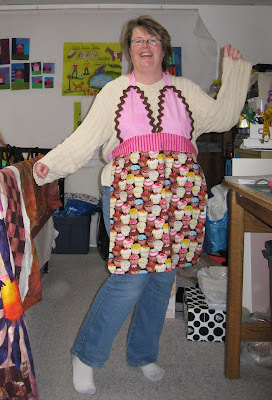 This is me modeling an apron I made for the Leduc Quilt Guild gift exchange at Christmas. 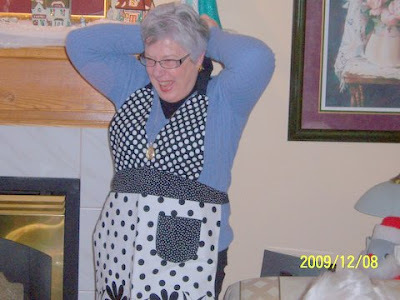 My friend Jean got my apron and have a great time modeling it. She is a great cook and wears aprons in the kitchen. The pattern was a called a Saturday Night Apron. 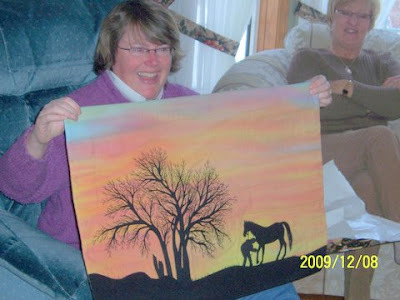 This is my friend Liz at our quilting bee group Christmas party, I drew her name this year. She loves to entertain and loves Black and White. She was very pleased to receive this gift. I made two other aprons as gifts this year. One black and white for my sister in law Gaylene and a Blue cupcake one for Joni in the Betty swap 5 baking exchange. I hold up my gift I got in the bee group exchange. My dear friend Marge drew my name. I guess she was really stuck was to what she was going to make me. She called this her 8 day project because she worked on it for 8 days before. If you have seen my blog much you will know I love my horses. Marge's Kids that are my age also trail ride horses. I love it and was in tears to see what she had made me. Marge used a piece of hand painted sky she made, she called it one of her best pieces. The tree branches are lots of fine thread play. 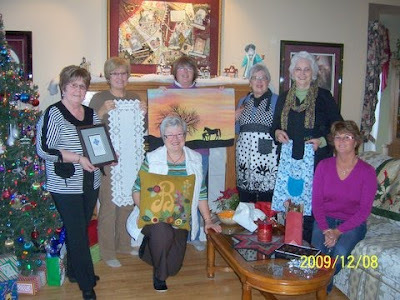 Here is all of the Bee group together holding our gifts. My mom, Betty is in front on her knee. We have been meeting in each others homes for at least 12 years now. We meet about twice a month on average. The last few winters some of the ladies are traveling to warmer climates so we have been meeting in the summer and sometimes have a month or two in the winter were we do not meet. I am the youngest of the group. These ladies are some of my best friends. I love them all dearly. We have been through a lot together. My babies being born, death, skin cancer and one new marriage and many many other life happenings. We are all masters of the needle and thread.